.... and I finally finished!! What an effort .... I knew it wouldn't come together in 5 mins but I never thought it would take that long. The first challenge for Deb's Master Blaster is a poppet challenge. The rules: Make a page using poppets (one must be you), use some bright colours, at least 20% of the page must be 3D, a journalling block with journalling to tell the story, use a pin and a paperclip somewhere on the page. 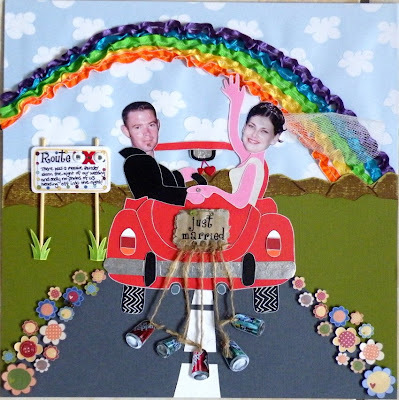 I have used Heidi Grace pp's for my page and lots of bazzil and coredinations scraps. Rainbow is made from gathered ribbons hand stitched in place. The night of our wedding there was a massive thunderstorm and even a blackout, so I have used this challenge to create an event that there are no pictures of ....... noone came outside to see us off ....... although I can't quite imagine why!!???? I love what you've done on this LO. Very Clever. Another one off the list.